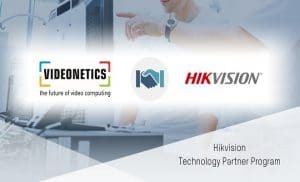 Hikvision, a leading provider of CCTV, security products and solutions in the world, has entered into technology partnership with Videonetics technology Pvt Ltd, a global leader in visual computing platform development. The association includes the integration of network cameras of Hikvision with Intelligent Video Management Software (IVMS) of Videonetics. The partnership will enable the customers to view, analyse and record Hikvision H.265+ compressed video streams from network cameras of Hikvision, in playback as well as real-time preview. This will also benefit the customers in the form of reduced cost of ownership due to low bandwidth and storage needs without compromising on the quality of video. Videonetics IVMS will enable the customers to view recorded video, real-time video feeds and to quickly navigate from one camera view to another. In addition, customers can export video image snapshots or videos from integrated cameras of Hikvision for advanced analysis like object classification, perimeter protection, crowd monitoring, object of interest, traffic monitoring, smart urban video analytics, etc. Moreover, with H.265+ smart codec technology of Hikvision, all the video streams will be compressed. Hikvision’s H.265+ smart codec technology considerably reduces the bandwidth consumption and storage needs. This becomes valuable when conditions of network are unstable or there is limited bandwidth, or when customers have to store data for longer time periods.